Guest Post: Competitive Casual – Harvest Time! I’m going to break my deck down into sections so I can talk about different aspects of it and how I went about designing them. Hopefully, that will be more effective than just dumping the whole list on you and rambling about a handful of random cards. Whenever Teneb, the harvester deals combat damage to a player, you may pay 2B. 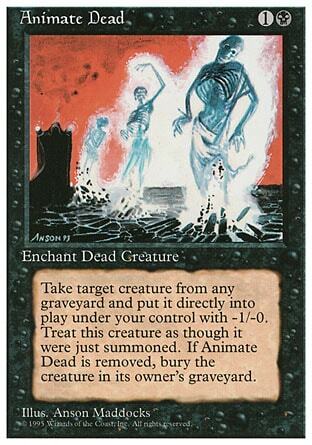 If you do, put target creature card in a graveyard onto the battlefield under your control. As I said, I enjoy making decks with three or more colors. In EDH though, this can be a problem if one doesn’t own a lot of mana-fixing: whereas in other formats you can pick two or three good lands and run playsets of them, in EDH you need a lot of unique cards that are reliable together. I’m lucky in that my collection (while not particularly strong when it comes to things like Standard) is rather large, and extremely varied. When I went looking for lands to support a three-color deck in singleton, I found that I had actually acquired a significant variety of them over the years. You’ll notice I’m running precious few basic lands–two of each of my colors. Yes, this does make me vulnerable to certain strategies like Blood Moon or Anathemancer, but I find that’s a minor risk that’s very well worth taking. My experience with three-color decks in EDH is that you want a handful of basic lands “just in case”, but beyond that, the fewer basics you’re running the smoother your mana is going to be. There are reasons to cut down on basics even if you don’t have access to a full spectrum of color fixer lands. (I know, not everybody has a random Vec Townships sitting in their nonbasic land box. Most people probably don’t even have a nonbasic land box.) 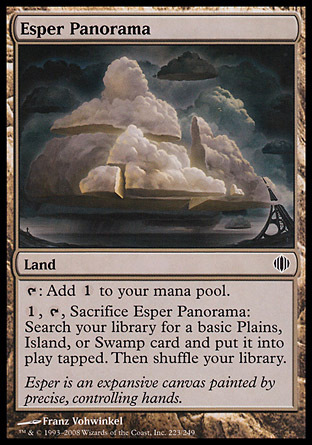 At the very least, you should think about replacing some basic lands with useful monocolored nonbasic ones, like the Cycling lands and man-lands. Extra little utility effects like these can help you dig your way out of tough spots, such as when you can’t find the colors to cast certain spells. I took my General’s cue and made this a fairly simple reanimator-beats deck, and its creatures are its heart and soul. My creature core starts small, and its early game is based entirely around utility. Big guys with cycling (either landcycling or the real thing) should absolutely be ditched early to accelerate my mana or draw; they’ll be nice and safe in my graveyard if I need to reanimate them later on. Cards like Necrotic Sliver, Magus of the Disk and Shriekmaw, meanwhile, help defend my exposed position by keeping the board clear of early threats and also put some bodies into graveyards for later. The finishers are where the deck gets fun, of course, and where my repressed inner Timmy gets to come out for a bit. (EDH is certainly the format for him to thrive.) As good as Teneb is, he’s hardly the only flagship this deck can ride to victory; in fact, I’ve filled the creature base with viable finishers from Akroma, Angel of Wrath and Scion of Darkness to Windbrisk Raptor and Dread. “Smash and swing” beaters like Angel of Despair and Reiver Demon also let me control threats without slowing down my aggressive game, while Woodfall Primus and friends help me answer other problem permanents. While the creatures are unarguably the most fun part of the deck (and, after all, the win condition), I like to think the spell base is where it really shines. There are a lot of really cool effects I’m pleased to have been able to work in here, and they’re a large part of why the deck tends to carry out its strategy so smoothly. It shouldn’t be a surprise that the strong arm of this deck and the way it muscles its way to dominance over other decks is in its suite of removal. 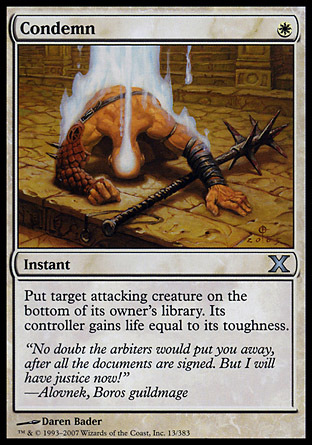 Now, I’ve been told by other EDH players that so-called “spot removal”–that is, kill spells that target specific creatures–doesn’t really have much value in this format since there are so many scary threats around. I have to politely disagree. While it’s true that running a token amount of removal can be inadequate, I’ve found that–at least in this deck, where every creature sent to a graveyard is automatic synergy with an inevitable reanimation spell drawn later–running a whole lot of removal can be really really good. With that in mind, my strategy here has been–at least in part–to run enough kill spells (both spot and mass removal) that I can answer anything my opponents decide to send my way. That said, I’ve taken a shrewder approach to the removal suite than simply throwing in every “kitchen sink” kill spell I can get my hands on. For this deck I handpicked only those removal spells that caught my eye by offering some special perk: the added utility of also addressing other permanent types, for example (like Mortify and Putrefy); or a substantial life swing as a bonus (the best example is Phthisis). It’s also worth pointing out that nearly every single one of my kill spells can at the very least kill whatever sort of creature I decide is necessary; there are no pesky “nonblack” effects here. I am not indifferent to the appeal of the two-(or-more)-for-ones promised by mass removal, either, and cards like Punishment and Decree of Pain back up the simple “Wrath and Disk package that others might have stopped with. Finally, the purpose of this deck is of course to reanimate, and I have a full suite of strong options there: Animate Dead, Profane Command, Rise from the Grave, Hymn of Rebirth, Crime, Beacon of Unrest, Liliana Vess, all the way up to Debtor’s Knell. Like my versatile removal package, you may notice that a lot of these have alternate modes or bonus effects besides simply reanimating, in case I need them for something else along the way. There’s also one thing nearly every one of them has in common: they let me steal creatures from my opponents’ graveyards as well as my own. Since I’m putting all that effort into killing things, I certainly want to be able to capitalize on that when I can. 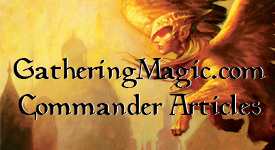 I should mention one other category of spells, because it finds its way into most decks I make–and most decks other people make, I would guess, whether they categorize this way or not. These are spells that are, simply put, too good not to run. Examples in this deck include Tooth and Nail and Phyrexian Arena. I don’t have much to say about cards like this other than to point out that they do come up, and that generally speaking they’re worth the space they take up, so don’t be afraid of them. Click here for the full decklist compiled. So there you have it: Teneb the Harvester EDH. I have a few other decks cooking, and I might break them down for you at a later date. Until then, have fun playing with your enemies’ creatures. This entry was posted on Monday, January 11th, 2010 at 10:32 am	and tagged with Teneb the Harvester and posted in Competitive Casual, EDH, Magic: the Gathering. You can follow any responses to this entry through the RSS 2.0 feed. I just finished up my first EDH deck, and I also used Teneb. However, rather than focusing on reanimation (despite the obvious connection), I decided to go with i deck that likes to sacrifice the same creature nine times with Grave Pact on the table. It’s interesting how a seemingly straightforward card can be taken two very different directions. Great article, definitely a good idea to reprint it here. Hey Alpha! I’m glad you liked the article. I’d love to see your decklist–Grave Pact decks are a pet love of mine. A small point, but you can’t use Mercy Killing to have an opponent sacrifice a creature with shroud, because the only think Mercy Killing targets is the creature. You’re correct. Both he and I missed it. But what it does do is allow you to get rid of Darksteel Colossus and other indestructible creatures (because it causes it to get sacrificed, not destroyed). Small detail, but good eye. Oh yeah, it’s still a good card to have in the deck, no doubt about that. @MtGColorPie: Any chance you can change the “by MtGColorPie” at the top of the article to “by Jake Kessler”? Thanks! Why on earth would you run desert twister when you are playing the colors for vindicate? And why Rise from the Grave over Zombify? Also, there are many cards that have much better synergy than some of the cards listed here. Karmic Guide is a great example. Someone already mentioned Buried Alive. Other good ones include Corpse Dance, Recurring Nightmare, Entomb, Yawgmoth’s Will, Sun Titan, Puppeteer Clique…there’s really soooo many more desirable cards. Not sure why Dread is here, because he will literally never be in the GY and that’s not what Teneb (and your other recursion) wants. Pernicious Deed would be a great addition – you could easily afford to lose weak cards like Weed Strangle, Brainspoil, and Phthisis.